"A mixture of The Lost Boys, Goonies, Indiana Jones and Batman. It's a series that's got life... eternal life! Alexander Lucard: You were a third-rate bungler when you forgot to wake up Hitler on D-Day, and nothing's changed. You cannot attack me here or anywhere, Nosferatu. I'm too strong for you, too strong... and too smart. Nosferatu: But I've already won. When the markets open in Tokyo, my greatest coup will be complete... I will own your company. Alexander Lucard: [laughs] Tomorrow, Nosferatu, nothing will have changed... I'll still be rich, and you'll still be stupid. Don't dismiss this as just a kid's series! Worth the watching. 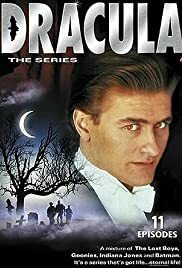 "Dracula: The Series" had all the elements of a forgettable kid's series, but was saved from that crowded ghetto by lush locations (Luxembourg), clever writing, and the wonderful presence of Geordie Johnson as the title character. Handsome, confident, and typically with a slight smile playing about his lips, Johnson brings a nice interpretation to the role. Rather than the tortured and sometimes wimpy psycho-studies we have too-often been subjected to in the vampire realm, Johnson's Dracula delights in being eternal and powerful -- he embraces his condition with relish. His Dracula is believably aristocratic and beguiling, while still being ruthless. Like any serial involving valiant hunters after evil, this show requires a certain suspension of disbelief. A multi-billionaire businessman as well as a vampire, Dracula could quickly snuff out his pursuers, either supernaturally or, far easier, just by arranging an "accident". But like all serials the foes have to continue so the stories can continue. The series at first focuses more on the children, even attempting to develop the older brother as a teen heartthrob, and tries to be topical by having Dracula listening to hip-hop and ska (and even making a Milli Vanilli joke). But it seems the show's producers quickly realized the appeal of Johnson, and began tailoring the show more to his talents. The scripts start moving away from the precocious younger brother and the teen angst of the older kids, to more mature themes -- later scripts are versions of "Casablanca" and "Pygmalion", and there is actually some very interesting examination of what it would be like to be immortal. A definite plus is the continuing character provided by Geraint Wyn Davies (later to be a vampire again in "Forever Knight", likely partly due to this role). Davies' Klaus has a lively maniacal presence, and a very memorable Frank-Gorshin-as-The-Riddler laugh. "Dracula: The Series" is a worthy addition to the vampire genre and deserves a look from anyone interested in the tradition. There are a few scenes which make as valid a commentary on the vampire state as other, more "serious" works; the writing is clever and surprisingly complex. It should not be overlooked because of being perceived only as a series for children.